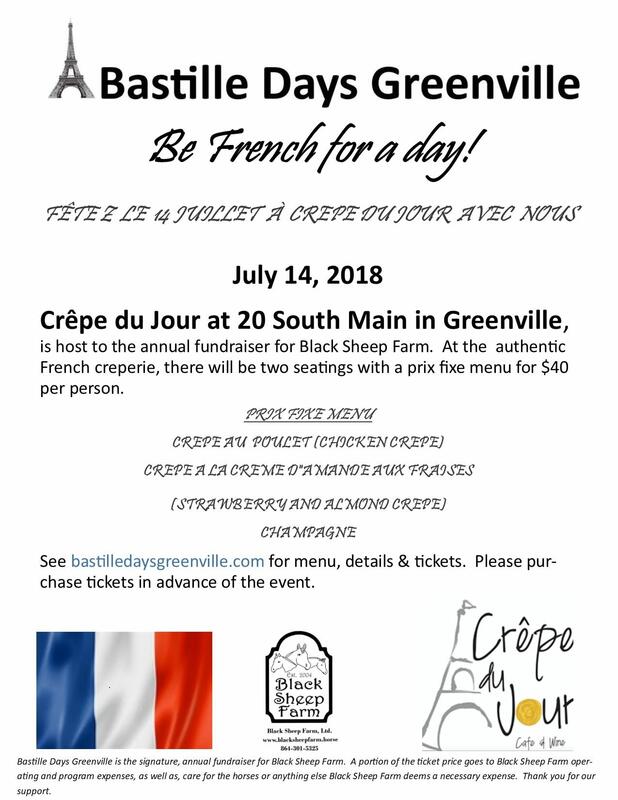 Bastille Day(s) Greenville is the annual, signature fundraiser for Black Sheep Farm, Ltd., a horse assisted education non-profit organization located in Fountain Inn. As we celebrate the French Independence Day, 14 juillet, we would like people to understand our motivation for celebration. The French are known, worldwide, for their fearless love of horses and natural horse training ability, consistently medaling at the Olympics, specialized police equestrian training, and being leaders in gaining government support for horse assisted education programs that provide significant benefit for tens of thousands of people worldwide. In Greenville, horses have a historical place in the Upstate, with Greenville long using horse shows for weekend entertainment, and, many other forms of enjoyment. Black Sheep Farm is honored to celebrate French culture and people in Greenville, and the Upstate, a region of the United States that has been fortunate enough to have a huge French influence over the last few decades. Crepe du Jour is host to the annual fundraiser for Black Sheep Farm. At the authentic French creperie, there will be two seatings with a prix fixe menu for $40 per person. Please purchase tickets in advance of the event. The main festival is held in Central, SC. Please see http://bastilledaysgreenville.com for more details.